This entry was posted on October 26, 2012 at 1:09 pm and is filed under 1978, 1979, Music, Rock, Uncategorized with tags Blondie, Classic Rock, Eat to the Beat, Fleetwood Mac, Get the Knack, hard rock, new wave, Parallel Lines, Rumours, The 1970s, The Eagles, The Long Run, Tusk. You can follow any responses to this entry through the RSS 2.0 feed. You can leave a response, or trackback from your own site. 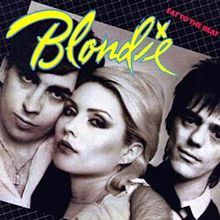 Did “Call Me” appear on an actual Blondie album or was it just on the soundtrack of American Gigolo? I need to know so I can get my metal facts right when I move onto 1980 which is still a way down the line. “Call Me” only appeared on the “American Gigolo” soundtrack in 1980. A 12″ single was released in both American and Spanish versions in 1980.
in 2001, the reissue of “Autoamerican” has “Call Me” as a bonus track… yet “Call Me” was never included on the original 1980 release of “Autoamerican”… (phew) it can get detailed sometimes, huh? LOL!